After my single year at Amador, I really got to know my best buddies at Chabot College. Several joined the Army after the draft numbers were announced. I stayed at home since my # was 340 and I was raised as an Army brat anyway. Dad's last gig was at the Pentagon. Formed an "oldies" band with Tom Evans and some guys on the Trinity Church-Dodgers lob-ball team. We're called Tommy and the 4 Speeds and we've been a band for 30 years now! 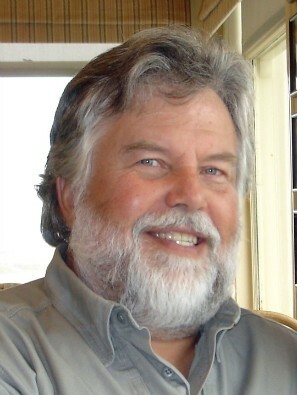 Got my degree in Biology at San Jose State and became a high school biology teacher in Dublin and in San Jose. After teaching for 30 years I recently retired. Now I plan to pursue some voice acting and music making. Still whackin' the softball around and occasionally playing a lousy round of golf. I really enjoy a nice glass of zinfandel now and then. When big Wayne Futak mashed a batting practice pitch from me onto the blacktop, the ball bouncing onto the locker room rooftop and being located later over by the F wing building. I feel very proud to have hit Wayne's bat right on the sweet spot. That wasn't very easy to do as I recall. I remember Wayne hitting another Moon shot during a low-scoring game vs Kennedy, I think. I was happily on first base with a walk. I got the steal sign; I swear Wayne had a bunt sign. I took off -- head down -- then heard a loud CRACK (remember wood bats?) and saw the left and center fielders with their backs turned running as fast as they could toward the FAR corner of the gym. That was the hardest-hit bunt in the history of the world. When I touched home with the winning run, Wayne was on second and the outfielders hadn't even gotten to the ball yet. A MONSTER hit. Hey Wayne... wanna play on my softball team? Steve Bailey has a birthday today. The ol' student body photo. 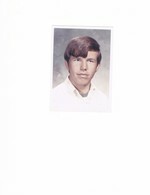 No senior pic was ever taken, since I was a lowly transfer student from Virginia. It woulda broken the camera anyway. 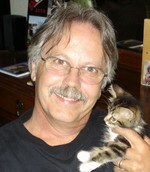 Here's a recent shot of Bill Ludwig with one of our cats.